This article is a case study about the impact of “unplugging” as it relates to reflective practice for youth and educators. If you’re interested in exploring reflection more broadly, and you’ll be attending the 2016 National Art Education Association Conference in Chicago next week, please join Mike Murawski and myself for our session “Reflective Practice in Museum Education” on Thursday, March 17 at 12 noon (McCormick Place/Lakeside Center/E271a). We’ll unpack reflective practice for museum educators in an interactive, conversational session—we hope to see you there! If you can’t join us, please comment here, tweet us (@chelseaemelie and @murawski27), or follow #NAEAReflect. When talking about unplugging, we always think of technology. However, I define unplugging as a way of regaining full control of yourself, physically and mentally, in any circumstances. In the summer of 2015, a group of New York City high schoolers and college freshmen, students in the Park Avenue Armory Youth Corps program, gather in the Board of Officers room at the Armory, reclined on lean-back floor seating in front of a grand piano. There is a buzz of anticipation in the air, which turns to quiet excitement when two world-class artists enter the room: performance artist Marina Abramović and pianist Igor Levit. During the next hour, Abramović and Levit give the students a crash course in unplugging and being present, major themes of their upcoming winter production—a hybrid performance/immersive experience to introduce audiences to a new method of engaging with classical music. Over the next few months, inspired by Abramović and Levit, a number of these students will deeply explore the concept of unplugging: what it is, why do it, and the unexpected realizations it can evoke about our own selves. Although some might stereotype today’s teenagers as one of the most “plugged-in,” smartphone-obsessed generations of all time, our students offered sophisticated, thoughtful reflections about how we can truly connect with each other and better understand ourselves. As one of the educators facilitating this project, I had the unique opportunity to experience this deep dive into unplugging alongside my students. This post explores both the impact of “unplugging” and reflective practice on teens as well as its impact on me as a teacher, and offers ideas about how we might apply the benefits of unplugging to our practice as art educators and museum leaders. We understand that not many people today know what it is like to be left in silence, stripped from their cellular devices, or even just stare into someone’s eyes… We stepped out of our comfort zone and… left wanting to try it again. Igor Levit and Marina Abramović’s Goldberg (which ran December 7–19, 2015 at Park Avenue Armory) required patrons to lock up their cell phones, watches, and personal belongings in lockers, then sit in silence in the Armory’s Drill Hall for 30 minutes to “unplug” and mentally prepare themselves to be present to listen to Johann Sebastian Bach’s Goldberg Variations, performed by Levit. Abramović’s method for listening to music was experienced by thousands, including New York City public high school students in a student matinee. The Youth Corps students were charged with developing ways to help their peers prepare for this uncommon experience. First, Youth Corps researched the artists and concepts behind Goldberg, familiarizing themselves with Bach, Levit, Abramović, performance art, and “slow” movements, from slow art to slow TV. They met with former Armory artist-in-residence Helga Davis, a vocalist and performance artist, who led the students through an activity in which they stared into each other’s eyes, opening themselves to their peers in a new way. They visited current artist-in-residence Imani Uzuri, whose singing and installation inspired by Sister Gertrude Morgan helped Youth Corps center themselves in mind and body. A printed Guide to Unplugging became one of two facets of the project. As their driving question for the guide, the Youth Corps responded in writing to the question: What is worth unplugging for? They used verbal storytelling and peer editing to brainstorm and solidify their ideas. Their written responses ranged from getting in tune with nature to bike-riding with no destination in mind, from challenging oneself to communicate with family members, to getting lost in artmaking. Others talked of experiencing theater or acting, and some about meditating or being present on their morning commutes. Across the board, students acknowledged the importance in getting out of your comfort zone in order to unplug—and how worth it the challenge of being present is. You can read the full Guide to Unplugging here. [Abramović had us start] by lying on the floor with our faces to the ceiling and having our hands to our hearts and stomachs. I felt like I was floating in the middle of the ocean, and found the comparison between the motion of the waves and the beating of my heart. That is when I realized I was in a full state of relaxation. To me, the noises of kids in the hallway outside faded into a nice summer day with seagulls and waves crashing onto the shore. And so the Youth Corps stood beside Abramović in front of 450 of their peers and shared their own personal experiences of Goldberg, then modeled the breathing exercise through which Abramović led the entire student audience. When she finished, the 55,000-square-foot Drill Hall was completely silent, and remained so during both the soundless preface and throughout Levit’s performance. Later, as students filed out, the Youth Corps gave each student a Guide to Unplugging, to explore how they could continue their experience outside of the Armory. We realized that unplugging is about being aware of your surroundings, reflecting on yourself, and being in control of who you are. Although my co-teacher and I felt as though we had barely scratched the surface of reflective practice, the students still showed growth and articulated takeaways from their reflective experiences this semester. From a quantitative standpoint, data gleaned from retrospective surveys show clear improvement in students’ skills in reflection: 80% of the students said that they reflected on their creative process and that their reflection influenced future choices more often than before they took part in the program. All of the students improved in developing the ability to communicate their ideas and/or find solutions through the creative process. Additionally, 100% also developed interpersonal skills through collaboration and leadership opportunities—closely aligned to the Youth Corps’ realization that reflecting and unplugging is not always a solitary activity, but often relates to our engagement with those around us. I also analyzed their written statements in the Guide to surface more specific themes about how the students felt the act of unplugging had affected them. In preparation for one of the sessions I am organizing at this year’s National Art Education Association Convention (see note above), I have been thinking a lot about what reflective practice is. The above impacts of “unplugging” identified by our students, are, I believe, all essential to reflective practice, no matter your age and whether or not you are consciously “unplugging” from daily stresses and technology. Going outside of our comfort zones and opening our minds to new ideas and beliefs allow us to stay nimble, keep learning, and be empathetic. We must be conscious of how we communicate, and ensure we remain connected to the world—both physically aware of what’s around us and metaphorically, empathetic to others’ lives and backgrounds. Staying focused and aware of our surroundings and interactions allow us to be present in the moment. Overall, these practices help us understand ourselves better—both on a personal level and our relationship with others. When you stop thinking about everything else and just focus on what you’re doing, you gain a new experience. You are open to things. In reflecting about how the semester went overall, my colleague/co-teacher, Pip Gengenbach, and I realized there was so much more we could have pushed the Youth Corps to try in exploring the idea not just of simply “unplugging,” but of truly being present. Of course, hindsight’s 20/20 and there is always room for improvement, but as I reread and analyzed the students’ writing, I found myself wishing we had facilitated even just one more session to encourage the students not to view being present as an end-game in and of itself, but to keep unpacking why the act is so important. These experiences are all ways that we can practice being present in our professional lives. Setting aside a phone and committing not to email during a meeting with staff or colleagues, or during a program; taking time to look for solutions together, in person rather than via email; going for a walk during lunchtime—for that matter, actually taking a lunch; and taking time for self-care outside of work (I for one fully endorse Destiny’s masking regimen) are all small things we can do to be mindful with ourselves and when communicating with others. Often we feel the need to put up a wall. We don’t want people to see certain parts of us, so we hide. But … when we allow ourselves to be vulnerable, we open ourselves and our minds. This is how we begin to surrender to unplugging instead of fighting it. We were then given the choice to come closer, go further away, or turn away from our partners. I personally chose to get closer to my partner because I wanted them to experience an awkward moment and adjust to it. I found myself visualizing my partner’s life line, and found it easy to see their comfort zone through their body language. My partner was fidgeting with their hands at first, but later on they adjusted. I also allowed them to look into my eyes without restrictions. I challenged myself to open up and dared myself not to worry about what they thought. The purpose was to [try] to interpret who we are… I [was] afraid to reveal my true self to someone that I barely know. I felt like my partner was not looking at me, but looking into me: she seemed… more aware of herself than I was. The jealousy that I felt helped me to unlock myself, I let all the painful moments that I have experienced out through my tears, because whatever she saw in me made me free. Unplugging in this way helped me to feel the support of the people around me. This almost paradoxical statement directly relates to being an educator and leader. It goes back to the old airline oxygen mask adage (help yourself before helping others): know yourself in order to more deeply connect with others. After all, our jobs are not isolated: we have students, colleagues, and/or a field-wide network whom we not only support and encourage, but of whom we can ask support and encouragement. When we allow ourselves to be vulnerable in this way, we are able to foster empathetic collaboration that can strengthen our ideas and work. I wholeheartedly endorse participating in something like this professionally, but perhaps more easily implementable and significantly less intimidating would be to try something like the Youth Corps’ mentor triads. During every Youth Corps program session, each education staff member works with a small group of two Youth Corps, where all members (staff included!) set a goal and hold each other accountable to it. Knowing that we were all equally committed and that we had a small group of people, most of whom we didn’t know well before our triads, who would be checking in on us are powerful incentives to keep on track. We meet for coffee or treats off-site, which made the whole experience seem special and important, but not a huge drain on busy schedules. And having a mixed group—one first-time student, one student who had been in the program already, and one adult educator—was an amazing way to stay fresh but also grounded. This would be easily replicable and powerful with groups of staff from different levels, areas, and even departments. Personally, I don’t like talking in front of crowds so I was really nervous. But Marina got us prepared by doing breathing exercises closely related to the Abramović Method, which helped me be less nervous… She made us feel like everything was fine and there wasn’t anything to worry about. How many of us have created activities or goals that we know will challenge our students or visitors, yet perhaps don’t always “walk the talk” ourselves by participating alongside them, or trying something new in our own practice? You’re not alone! As I delved into ongoing reflection with the Youth Corps this semester, I was reminded that it is so important as an educator (and leader) to model taking up challenges, just as we expect our students to do, and to always be learning, never complacent. I am grateful to Marina. I think what’s cool about her is that she does things that others are afraid to do. She’s taught me to always stand out. Awareness of self—of our strengths and our weaknesses, of our relation to others and to the world around us—is a key trait of leadership, no matter where in an organization’s hierarchy your job may place you. Understanding our own identity, through reflective practice, allows us to better understand our own work, how we teach, and the place of our institution and programs in our students’ or visitors’ lives. Youth are in a key phase of their life where they themselves are testing out and defining who they are as people—their interests, beliefs, connections, and communities. But as we all know, it’s not only youth who use museums and cultural institutions as spaces for meaning-making and self-understanding or reflection; visitors of all ages and backgrounds do the same. And it’s important to remember that we ourselves as educators participate in this process as well, every time we reflect on our teaching practice, on our role as leaders in our institutions, or as participants in the world. Being conscious of the reflective process—being present in it, if you will—allows us to be intentional about our teaching practice, improve our connections with our audiences, and ultimately create experiences for all that bring our institutions more deeply into our visitors’ lives. Over the summer, I helped a group of teens make a mobile game at the Brooklyn Museum. That’s a pretty innocuous-looking sentence, but it felt like a big, exciting Project of Note. There were plenty of interesting factors at play: it was my own first foray beyond digital game design into actual game creation; it was a chance to see my home institution’s collections from a new point of view; it was a different kind of programming from my usual roster. But it’s now almost two months later, and I’m still thinking about it. Why? What made it so special? This was a program called NYC Haunts, in which teens work together to design and create a location-based game people can play on their mobile devices. It’s run by Global Kids, a great organization that has all kinds of initiatives to help teens become informed citizens of the world. They’ve run this program in schools and libraries before, and this was the first version done in a museum. NYC Haunts teaches teens the basics of game design and uses TaleBlazer (a free game-design app from MIT’s Scheller Teacher Education Program) to build the game. TaleBlazer is a visual programming platform, which means you don’t write the code textually. Instead, you put it together using click-and-drag building blocks that combine to form commands. The game itself is designed to help a player solve a mystery about local ghosts of the past who may still be lingering around in the present. 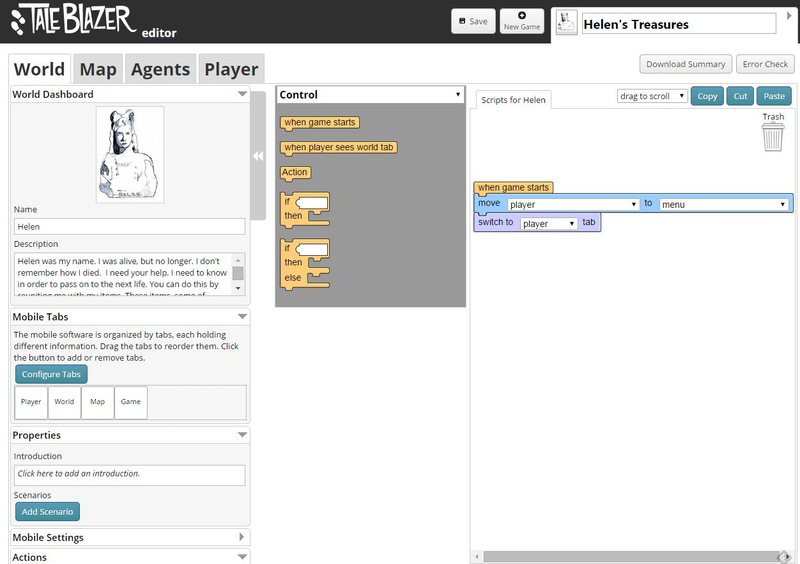 Screenshot of the TaleBlazer interface. In the Brooklyn Museum game, our team of thirteen intrepid teen Ghost Hunters collaborated on a game that invites visitors to explore our Luce Visible Storage Center. The game is called Helen’s Treasures, and the player must find all the precious items collected by Helen (the ghost protagonist of our game, based on a Chester Beach marble bust), in order to help her remember how she died so her spirit can be at peace. 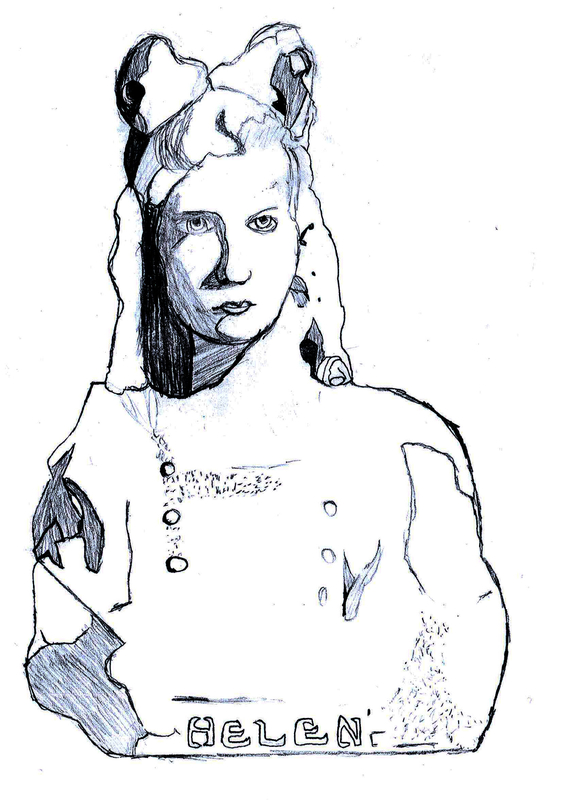 In-game illustration of Helen by one NYC Haunts Ghost Hunter. A big part of what made it feel so special, though, was the open-hearted, open-ended nature of the whole project and that fact that the teens were building something together from the ground up. Before we talked at all about the museum-specific side of things, we spent a good chunk of time talking (and iterating) about what makes a game successful and how the game design process works. We started with the basics, which fed into conversations that started to sound a whole lot like the kind of conversations museum educators have when coming up with programming ideas. There was debate over how the game should feel to a player and how to create that feeling. What were the goals of the game going to be and how should they be met? What did we want our players to get out of their game experience? Once the game creation itself got underway, I co-facilitated the meetings with Global Kids staff, but we tried to stay out of the way of the process as much as possible. The teens decided what area of the museum they wanted as the location of their game. They collaborated on the game’s story. They worked smoothly as a whole group and then as small groups that focused variously on coding, choosing specific collection objects, creating the in-game visuals, and writing the detailed story players discover as they go. And what they came up with, after only eight afternoon sessions, was a playable game that made my museum educator heart thump proudly. It was the teens, not me, who identified that it was important for a player to look closely at art objects to answer the game’s questions. It was the teens who chose the Visible Storage Center for both the artwork and the atmosphere (it’s cold and dim in there, as well as being full of shelves bursting with miscellaneous, sometimes-mysterious things). It was the teens who created a cohesive story that brought new meaning to objects in the Museum’s collection. They told engaging and creative stories, they created an immersive experience, and they made a fun, new way for people to discover an often-unexplored space. Those sound remarkably like some of my Big Goals as a museum educator. I’m trying to keep these lessons fresh in my mind as I head into a new school year of programming for teachers. How can I hang onto that spirit of open exploration? How can I help teachers see the museum in new ways? What experiences can I create that are playful and fun and build skills in the museum, all at the same time? I know there’s plenty of debate about digital games in the museum (should museums collect video games as art? why is gamification such a dirty word? what advantages do games have to offer museums, anyway? ), and I’d love to hear from others who’ve experimented with games in museums (to resounding success or constructive failure). I don’t know how much game design I’ll be doing in the future, but I do know I appreciate having tried it out and that it offered plenty of valuable things to keep in mind for my museum programming overall. So, thanks to the clever Brooklyn Museum Ghost Hunters and to the energetic staff of Global Kids, not to mention the Hive Digital Media Learning Fund who believed in the project enough to give us the money for it. One final note: If you’d like to playtest the prototype of the Brooklyn Museum NYC Haunts game, you can download TaleBlazer for free (Android or iOS). Open it on your device and enter gvxkfju in the “Game Code” tab at the top. Helen’s Treasures will download to your device, and then you’re free to play, even without wifi. How Can Museums Change Teens — and Vice Versa? 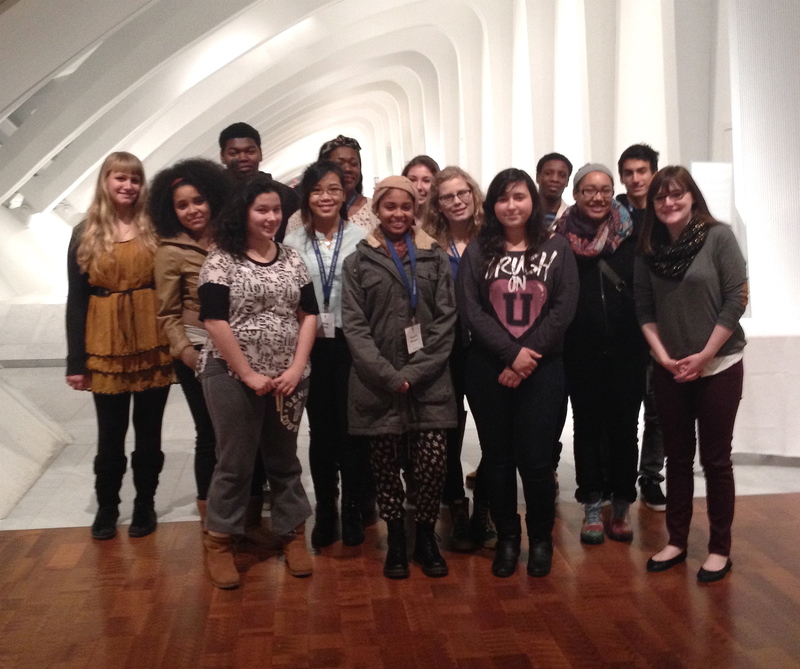 Over the past four years, I have worked with hundreds of Milwaukee-area teens who love art, and who, over their time in teen programs at the Milwaukee Art Museum, grow to love museums as well. I have always had a sense that my students grow over their time at the Museum. This year, though, to really study that growth, we designed our longstanding Satellite High School Program as a year-long experience to explore exactly how weekly sessions at an art museum might change the thinking of our teen participants. To that end, our program outcome for students was that they would show an increased ability to reflect upon their own experiences and performance. Evaluation is a grey area—much like teaching and interpretation—and we as educators need to use multiple methods in order to get a fuller picture of what’s going on with our students. This means I’ve been thinking a lot about evaluation: How do we show change was made? Years ago, I thought evaluation was more or less a prickly, black-and-white, necessary evil that forced me to use altogether too much math. But over the past two years, I’ve come around to believe evaluation is completely the opposite (though math is still important!). Evaluation is a grey area—much like teaching and interpretation—and we as educators need to use multiple methods in order to get a fuller picture of what’s going on with our students. And further, these methods can be tools to help our teaching, improving programs and our impact on students. In the end, I found I needed to use reflective practice myself to understand how my students were changing, and to explore and experiment with a number of different methods for articulating their growth. In this post, I’ll share a few of the methods we used in the Satellite High School Program this year to explore how our teen interns changed through reflective practice. The Satellite High School Program is a year-long internship for sixteen teens ages 16 to 18 from diverse high schools all over the Milwaukee area. Once a week after school, they come together at the Museum and explore how art can be made relevant to our lives today. They participate in “object studies” (hour-long discussions on a single work of art), behind-the-scenes career talks with staff, and resume-writing workshops, and also mentor elementary school students in tours of the permanent collection. Teens create a final project that has a real-world impact on the Museum. They choose a work of art in the Museum Collection, research it, and form their own interpretation of the piece. In past years, students have created responses in visual art, writing, or performance. This year, the students used iPads to create videos on their work of art, explaining what the work means to them and how it changed their thinking or art practice. You’ll see a few of those videos later in this post. Let’s start with the core evaluation method we used for the program. We were lucky to work with one of our teen program funders, the Milwaukee Public Schools Partnership for the Arts & Humanities, and the University of Wisconsin-Milwaukee’s Center for Urban Initiatives and Research (CUIR) to develop the outcome above and to establish a tool to measure it. We settled on one-on-one interviews, doing a “pre” interview on the first days of the program in October and a “post” interview on the final days of the program in May. Each student was privately asked the same set of questions in the pre- and post-interviews, meant to get at their ability to reflect on their experiences in the program. 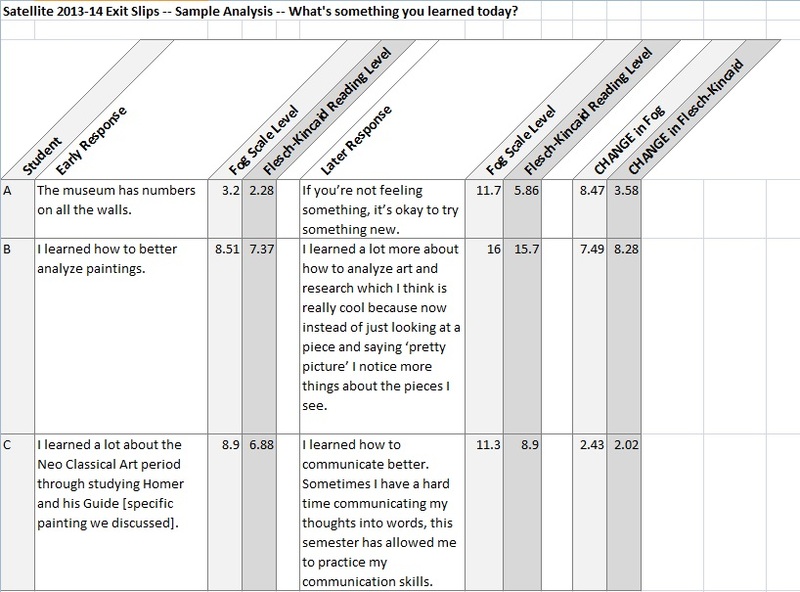 I scored each interview on a rubric that measured level of detail in their responses, and then we compared their pre-program score to their post-program score to see if they had improved. At the end, every student did improve in their ability to reflect—their answers got significantly more detailed. As someone whose default is to be a more qualitative thinker, it was rewarding to use the rubric to see their interviews as data, in a quantitative, more tangible way. But as helpful as this was, it’s still just one method of evaluation. Being able to explain in detail is certainly one aspect of successfully being able to reflect. But as I listened to their responses, and thought about what I had seen in the students over the course of the whole year, I realized there is much more to reflecting than just detail. Their responses used stronger vocabulary, they expressed sophisticated ideas, and they asked more and deeper questions. How could I articulate that kind of change? Happily, along the way, we also found that we had collected some unexpected data which helped me more concretely see the change in my students. At the end of each session, teens used a web app on their iPads called Infuse Learning to fill out a quick exit slip survey. Exit slips are an easy way to take the pulse of your students at the end of a session. For Satellite, they answered the questions “What is something you learned today?” and “What are you still wondering about?” Though different from our interview questions, these certainly also support reflective practice by thinking back on the day’s session. As the year went on, I noticed that the teens ‘ responses were growing more sophisticated: they were longer, they used more art vocabulary, and they realized that they might not be able to answer questions definitively, if at all. At the suggestion of Marianna Adams, who specializes in museum research and evaluation, I tried running these responses through two readability tests to see if that would quantify the sophistication of these responses. One test produces the sample’s Fog Scale Level, which measures syllable count and sentence length (a score of 5 being readable, 20 being very difficult). The other was for the Flesch-Kincaid Grade Level, which approximates the average grade level necessary to read and understand the text. For the first question (“What is something you learned today?”), students’ scores jumped considerably in Fog Scale and Reading Level. Since these tests measure syllable count, sentence length, and grade level, this corroborates with what I found in the core evaluation. But I was surprised to see that when I tested responses to the second question (“What are you still wondering about?”), students’ scores actually dropped! Yet if you read their responses, there is a drastic change—for the better. Take Student D’s responses. In his early answer, he asks a relatively basic art historical question about distinguishing one type of art from another. In his later response, he is thinking deeply about the purpose of art and how we even decide what art is. And while Student F uses high-level art history vocabulary in her first response, it’s without context; later on, she’s thinking about how two seemingly opposite concepts may have something in common after all. The scores of these comments may have decreased, but I’d argue that their reflective quality increased—the teens ask big questions that might not have an answer; they ditch high-level vocabulary to more informally muse on philosophical questions of art, destruction, and race. Running these responses through the tests helped me see, again, that while tools can be helpful, they’re ultimately just one tool—we need more than one to paint a bigger picture. To round out that image, I’ll share one final unexpected evaluation tool: the teens’ final project videos as well as a talkback session they conducted at their video premiere. For their final project, each student chose one work of art in the Museum Collection and looked at it, researched it, and talked about it with others for seven months. (Given that most visitors spend under 10 seconds looking at art in museum galleries, this is a feat in and of itself!) They distilled a school year’s worth of thinking into brief, 2-4 minute videos that answered what the work meant to them, what it had meant to others, and how their own thinking had changed as a result of looking at the piece—all questions with, of course, that familiar reflective bent. The teens also participated in a talk-back/Q&A at the celebration where we premiered these final projects. Guests—museum staff, teachers, family, and friends—asked the group questions about their experience. If you like, you can watch the teens’ videos, along with the Q&A, in the YouTube playlist below. 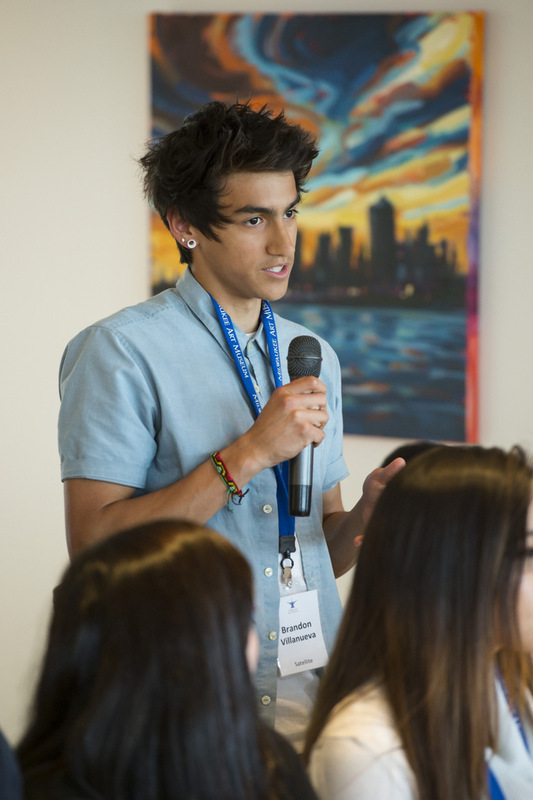 Impact — Can Museums Change Teens? So: does all the above—interviews, exit slips, readability tests, and final projects—add up to a full image of the impact that a year’s worth of reflective practice can have on students? I’m not sure we can ever paint a full picture of student growth in intensive programs such as this one. I do think combining all of these tools can help, though—especially if the evaluative tools actively support the goal of the program. The interviews, exit slips, and activities were all intentionally structured to be reflective, related to the outcome itself. This relevancy was key, not only in genuinely evaluating the program’s success, but also in supporting the students’ abilities through the methods themselves. It’s also important that we educators make the program goal transparent to the students. The Satellite interns knew from the beginning that they were working on reflective ability—this helped prime them to think reflectively from the get-go. From the other evaluation tools, we saw that the students developed their ability to reflect on themselves and their own performance. But as seen in the comments above, they were also able to develop skills reflecting on the world beyond them—the world of art history, their future careers, how they interact with other people. All of these are ways of thinking that are valuable for their futures, as they go to college, discover their passions, and pursue meaningful career opportunities. I’ve shown how this program helped these students grow in many ways. What about the Museum itself? Have these students had an impact on our institutional practice? Institutions move at a slower pace than most programs, and if change and impact are complex to measure in sixteen individual students, then it’s multiplied tenfold for an organization that serves hundreds of thousands visitors a year. Even so, over the past few years, the work of teens in our programs has slowly but surely worked its way into the daily fabric of the Museum. Teens have interviewed artists on behalf of the institution. They have advised docents on ideas for giving tours to high schoolers. Their video projects will be part of on-site and online Collection Resources at the Museum, as well as our Archives, for all visitors to access while learning about works of art. Ultimately, evaluation and impact are ongoing, a grey area that has a lot in common with the act of teaching itself. When done well and intentionally, evaluation doesn’t just show if we’ve met a goal. The tools we use to evaluate ideally become part of our teaching practice, because they reinforce the very abilities we are trying to help our students develop. As for what I’m still wondering about? This year, our evaluation methods for the most part required the teens to have specific existing skills, such as writing for the exit slips or proficiency in using an iPad (though we did have video-making workshops as part of the program). I’m thinking about other ways to holistically gather data. 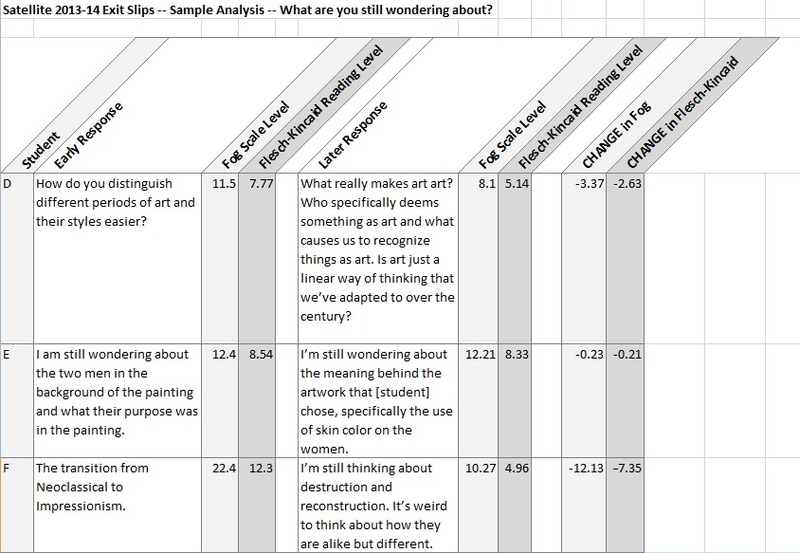 For example, given that much of our evaluation methods emerged from teaching tools, should I document or film our discussions with works of art and find ways to analyze them? I’d love to hear any ideas or tools you’ve used to evaluate your programs, just as I hope this post has inspired you to take a fresh look at your teaching practice and find unexpected ways to see the growth in your participants. CHELSEA EMELIE KELLY: Manager of Digital Learning at the Milwaukee Art Museum, where she develops educational technology initiatives and oversees and teaches teen programs. 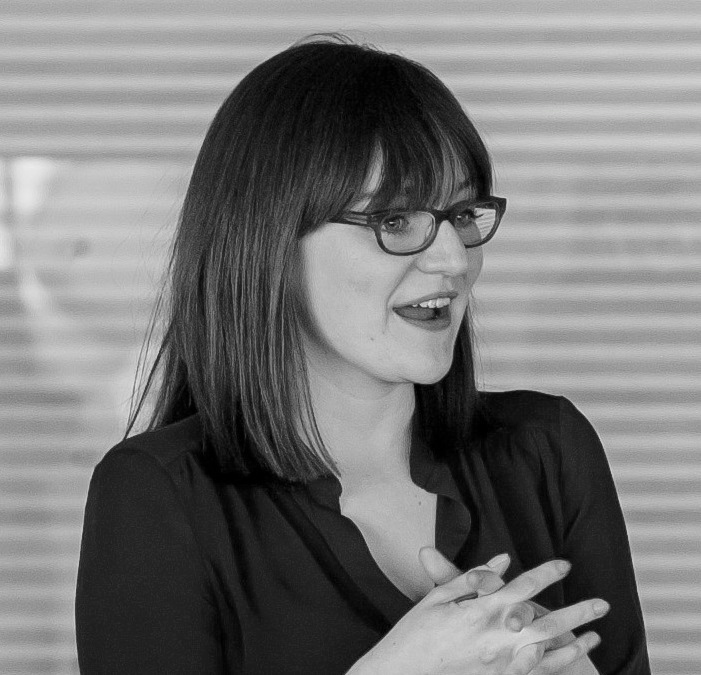 She is passionate about using gallery teaching and technology to foster relevancy for art museums in the 21st century. She has previously worked at the Frances Lehman Loeb Art Center, the Metropolitan Museum of Art, the Frick Art & Historical Center, and the Carnegie Museum of Art. Chelsea is a graduate of Vassar College and holds an M.S.Ed. in Leadership in Museum Education from the Bank Street College Graduate School of Education, where she was a Kress Foundation Fellow. She is also the founder and co-editor of The Art History Blog. Chelsea’s postings on this site are her own and don’t necessarily represent the Milwaukee Art Museum’s positions, strategies, or opinions. Sara shares her thoughts on Jean Joseph Benjamin Constant’s “Evening on the Seashore—Tangiers.” Photo by Nate Pyper. How do we engage teenagers at art museums? Our museums offer powerful classes, internships, and multi-visit programs–but their reach is limited. For many teens, their first (and sometimes only) exposure to an art museum is through a school field trip. There are already a number of great conversations on this site posing suggestions and challenges for ideal school tours, which consider the needs and perspectives of the museum educator and the classroom teacher. But what about asking the students themselves?In summer 2012, we did just that at the Milwaukee Art Museum. A group of fourteen teen interns teamed up with ten docents to delve deep into what can make a school tour successful and engaging. They worked to jointly share ideas and troubleshoot concerns. The session was such a hit for both groups that we decided to bring back five of those students this fall to share their thoughts with our full docent corps–all 100+ of them! We taped the dialogue so that we could share the teens’ ideas as faithfully as possible. 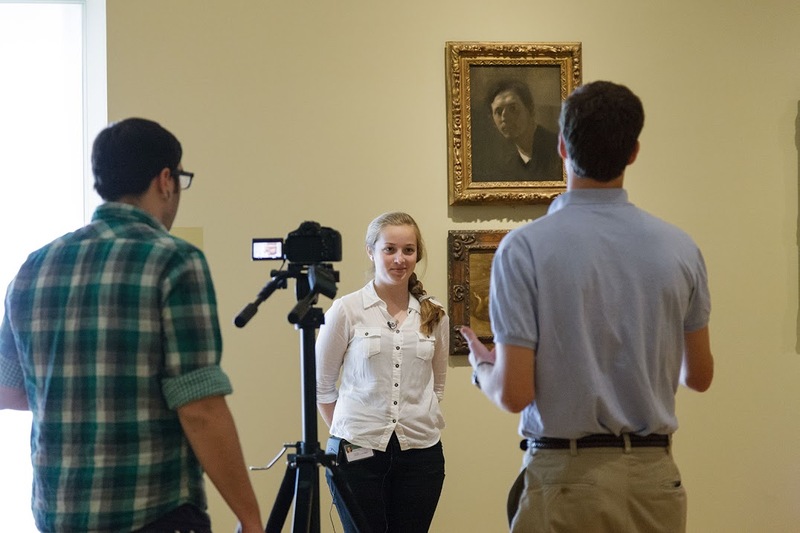 The video below shows the five summer teen interns in dialogue with our docents. The teens quickly do a check-in/icebreaker with the docents, describe the summer program, and facilitate a Q&A session. Take the time to get to know each other (even if the tour is only an hour). Over the summer, I began our sessions with a “check in” activity, inspired by the Milwaukee Writing Project, as a way for us to get to know each other. If you know your audience, you can tailor your tour to their interests from the get-go. As Rosehaydee said in the video, it can bring the group together and set a friendly tone. Be aware of your group–and do what they want to do. Be in tune with your group and their reactions: if something’s not working, move on rather than pressing it. Be yourself. Share your passion, and be friendly and relaxed. As Sensei said, if you are enthusiastic about what you’re discussing, chances are good that your group will respond to your enthusiasm. Museum tours can be intimidating. Teens are aware that docents and educators are extremely knowledgeable; and it’s scary to offer your thoughts in front of not just a docent but also your peers. To support conversation, Steven suggested using clear, simple language (without being patronizing), and Rosehaydee encouraged us to acknowledge student voices, even if they’re not the “right” answer, so teens know they’re being heard. Technology is a tool, not a goal. 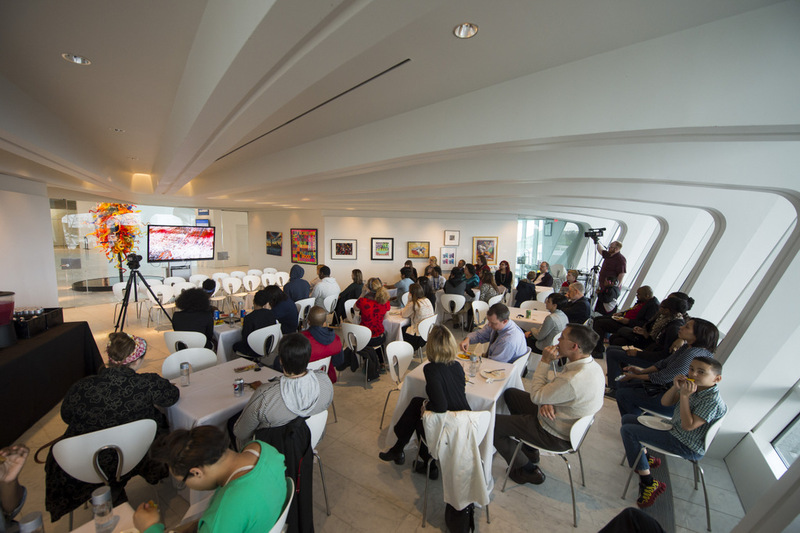 When asked if museums should use more technology to engage teens, responses were mixed. Yes, technology is cool and lots of teens use it–but not all teens have access, and technology is not always successful or necessary. If the activity can be done equally as well or better in analogue format, it’s probably not worth it to try to use a gadget. But if it’s something that can only be done with technology–like Skyping with an artist or out-of-town group–then take the time to give it a try. Remember that we all learn differently. To combat teen boredom, Rosehaydee suggested calling on specific individuals to get them to pay attention, but Sensei noted that sometimes it can be just as effective to try a pair-share or solitary writing activity. This reminded me that museum educators and docents have a responsibility to provide many different kinds of learning opportunities for our students. We need to know when to support and when to gently challenge them. Respect the group; think of them as family. One of my favorite suggestions from the teens over the summer was for docents to think of the teens as their children or grandchildren. To me, this gets to the heart of working with any visitor that comes into our space: respect them–their prior knowledge, their interests, their reasons for coming to museums in the first place. We can learn from visitors as much as (if not more than!) they can learn from us. Sometimes, as we plan programs and tours, educational goals and strict standards can overshadow the much more abstract magic that can come from engaging with works of art. I’m glad these young people remind us of the steps we can take to achieve that “bigger picture”: a museum experience that is supportive, interesting, and fun. Such experiences help teens know that museums are places where they can be themselves, connect with peers who also love art, enrich their thinking, or simply take a break from a busy day of school. 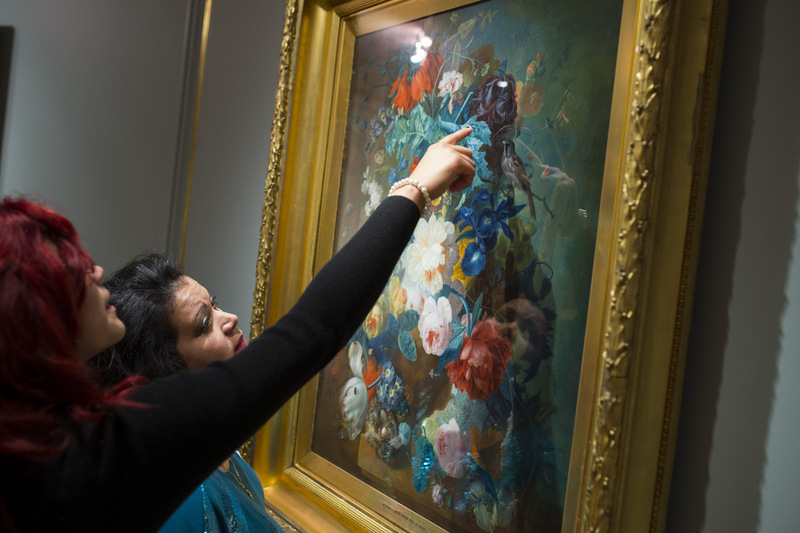 Helena discusses Fragonard’s “The Shepherdess” in the Milwaukee Art Museum galleries. Photo by Nate Pyper.